Double-Pedestal Credenza Is Part Of The Lorell Commercial Steel Desk Series With Commercial-Quality Performance And Components. Durable Steel Chassis Supports A 1-1/8" Thick, Laminated Top. Laminate Is Stain-Resistant And Scratch-Resistant For Durability. 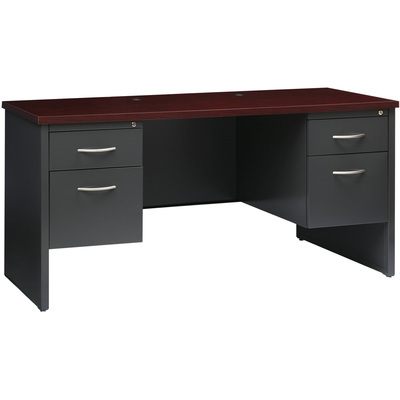 This 60" Wide, Double-Pedestal Credenza With Adjustable Leveling Glides Can Be Used Freestanding Or Paired With A Stack-On Hutch And Other Elements To Create An Executive Workstation. Each Locking Pedestal Includes One Box Drawer For Small Supplies And One File Drawer. File Drawers With Premium Arch-Pull Handles Accept Hanging File Folders. Steel Ball-Bearing Suspension Is Easy To Operate Quietly. Built-In Cord Management With Two Grommets In The Top And Two More Grommets On The End Panels Provides Easy Access To Power And Data While Minimizing Clutter. The Rich Mahogany Laminate And Charcoal Paint Create An Upscale Look And Feel For Any Application. Superior Steel Construction Withstands Heavy Activity And Relocation..
Double-Pedestal Credenza Is Part Of The Lorell Commercial Steel Desk Series With Commercial-Quality Performance And Components. Durable Steel Chassis Supports A 1-1/8" Thick, Laminated Top. Laminate Is Stain-Resistant And Scratch-Resistant For Durability. This 60" Wide, Double-Pedestal Credenza With Adjustable Leveling Glides Can Be Used Freestanding Or Paired With A Stack-On Hutch And Other Elements To Create An Executive Workstation. Each Locking Pedestal Includes One Box Drawer For Small Supplies And One File Drawer. File Drawers With Premium Arch-Pull Handles Accept Hanging File Folders. Steel Ball-Bearing Suspension Is Easy To Operate Quietly. Built-In Cord Management With Two Grommets In The Top And Two More Grommets On The End Panels Provides Easy Access To Power And Data While Minimizing Clutter. The Rich Mahogany Laminate And Charcoal Paint Create An Upscale Look And Feel For Any Application. Superior Steel Construction Withstands Heavy Activity And Relocation.